Año 2016: También suelta el Trineo de madera rojo. Balón de fútbol de edición especiall, this item is 2x in your toy box. The look is the same, it does do the same. The items below are new this year. Edit; Why is this post demoted ? Regalo robado is a reward for completing the daily ¡Qué ruin! / ¡Qué ruin!. This item is a great source of toys and pets, including gifts from past Winter Veil, as well as the ilvl 635 BoE dagger Árbol del Festival de Invierno en miniatura. New to 2014 is Pergamino de narración de historias, Árbol del Festival de Invierno en miniatura, and Mando de volador de carreras triturador. Time once again for me to mail every good little gamer his just reward...a lump of Coal for all the whiners foretold. For those who have tons of characters level 80+ like myself. You may end up doing the quest to get this item multiple times, and like me, you may have forgotten which ones have or have not done the quest. So here are some simple scripts that print on your screen if you have or have not done the quest. Please note, that the quests are different for horde and alliance. So for people like me with both Horde and Alliance characters here are both scripts. Just something to consider if you're after the the dagger: Miniature Winter Veil Tree. On the tooltip on this page, it says the dagger's iLvl is 600. But when you go to the page for the danger itself, it's listed as iLvl 630; which at this stage in the game is a 5 lvl upgrade for me in my offhand; and certainly it's worth doing the daily on any toon that's not raiding or doing heroics. After the lastest Server Restarts (31st December), it seems to always contain a toy. I did this Daily for 11 days in a row with 9 characters and I received more toys today alone than I did in the last 11 days combined. For some reason, ¡Qué ruin!/¡Qué ruin! is still handing this out instead of the new 2015-16 Regalo robado. Perhaps they'll fix it soon? Edit: At this point it seems pretty clear they've modified the old one instead of rewarding the new one. Lounge Cushions can now be found here, while last year they came from Obsequio ligeramente agitado. Oddly, they did use a new Obsequio ligeramente agitado item for the first time, while this present, which has historically been new every year, was recycled. I did just drop a lounge cushion from this. Mechanical Battle Pet (Robot cohete de cuerda). Can be caged, and sold on the Auction House or traded. 30 second cooldown. Summons a zeppelin that can be used for 5 minutes and has 3 abilities: Cañón, Emplazar mina and Aceleración nitrosa. Can be used to battle other toys. 30 second cooldown. Summons a small plane that can be used for 5 minutes and has 2 abilities: Ataque con cohete and Postcombustión. Stuns your character for 3 seconds when ended (flyer is destroyed, moves too far away, or buff expires/is cancelled). Can be used to battle other toys. 30 second cooldown. Summons a small shredder that can be used for 5 minutes and has 2 abilities: Triturar and Servosalto. Can be used to battle other toys. 30 second cooldown. Summons a small tonk that can be used for 5 minutes and has 3 abilities: Corriente de llamas, Mortero llameante and Hierro nitroso. Can be used to battle other toys. Has unique abilities from the other tonks in the Iron Armada set. 30 minute cooldown. Acts as a snowblower on your target. Regalo robado is obtained from the Winter Veil daily quest ¡Qué ruin! (H)/¡Qué ruin! (A). It requires you to kill the Grinch el Abominable in Hillsbrad Foothills to free Metzen el Reno, as well as to recover Dulces robados, which spawn only after the Greench is killed. The quest can be done 18 times per character over the course of the Winter Veil holiday. 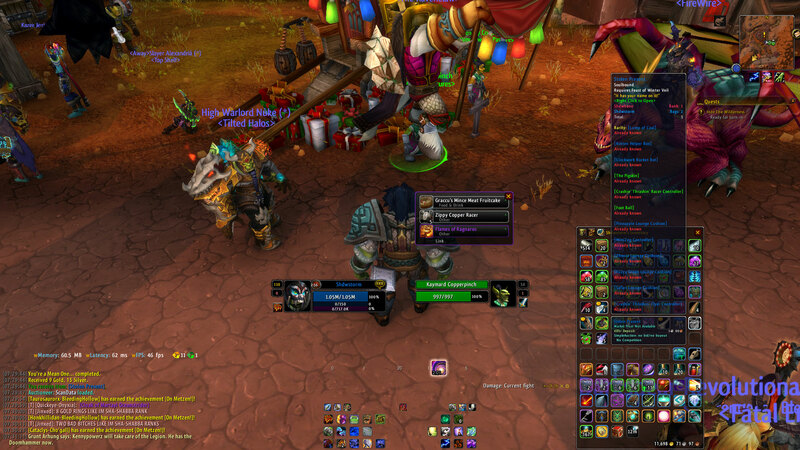 As the level requirement is 80, any alts at or above this level can also do this for another Regalo robado. Per a Senior Dev on Twitter, this item will be added as a possible reward from Regalo robado starting in Winter Veil 2016. -As soon as you log in use Teletransporte a: Forjaz and pick up ¡Qué ruin! -Use Teletransporte a: Forjaz once again and turn in the Quest (Don't forget to turn in Un agradecimiento de Pastos de Bosquehumeante aswell. -After that just delete the character and do steps 1-4 again. Per a Senior Dev on Twitter, Ilusión: Llamas de Ragnaros is a possible reward from Regalo robado starting in Winter Veil 2016. Apparently this item can also contain the Ilusión: Yugo del invierno weapon illusion. Wowhead only shows Ilusión: Yugo del invierno as being dropped by the Obsequio especial de Pastos de Bosquehumeante from the quest Un agradecimiento de Pastos de Bosquehumeante (A), Un agradecimiento de Pastos de Bosquehumeante (H), but my friend who has yet to complete that quest got the illlusion in the Regalo robado from the quest ¡Qué ruin! (A), ¡Qué ruin! (H). This leads me to believe that it may be possible to also loot Ilusión: Llamas de Ragnaros from Regalo robado. The drop rate is most likely the same as it is from the Obsequio especial de Pastos de Bosquehumeante. Proof that the Flames drop from the daily present, so keep going! Confirmation, Ilusión: Llamas de Ragnaros can be obtained this year from a Regalo robado. Edit: Looks like the loot list was updated. Good luck everyone! In 2016 this can now contain Trineo de madera rojo, which in 2015 came from Obsequio ligeramente agitado. The Cojín verde con flecos is not in the loot table or my luck is really bad; 7 days with 24 characters and no Cojín verde con flecos. 139 attempts this year yet no Controlador de flameadora trituradora. The drop rate is abysmal. Required for an achievement that everyone got for free last year from under the tree and anyone who missed Winter Veil 2015 is heavily punished just fishing for rng for 2 weeks of the year. This is the real rare drop! Got both weapon enchants. I just looted this new trinket Regalo resplandeciente from a Regalo robado! As of 2017, it seems if you have a trial character (or at least not max level) you don't get the blue rarity of this reward. I imagine this was done specifically to thwart the farming used last year (chiefly for Ragnaros illusion). It doesn't contain the old toys, only the food items. The non-daily reward seems the same but as I have yet to see an illusion from a trial character I can't confirm that it was not changed and is still a valid farm technique. EDIT: Did just receive flames from the daily blue reward (level 110 character) so that part is unchanged. I wish each of you the best of luck this holiday season! 2017 added Regalo resplandeciente to the list of items obtainable from the Present. From various reports, it seems that the item itself has no level restriction, but it scales properly according to your character's level. On a side note, the animation of the proc is pretty hilarious. El regalo perfecto in fact, make a present appear on top of character's head and it opens it! Clockwork bot 2% my undead posterior. I got 8 today. The same amount of runs, the same amount of bots. What are the odds, eh? If you're like me and want to get your ragnaros illusion this year just to realize this version of the present (the one that contains all the good stuff) is not available for trial characters I have another solution for you. I wanted to ask something: since it says this version of the gift has been used from 2014 and since the Flame of Ragnaros illusion has only been introduced in 2016, does this mean that its drop rate it's actually "deflated" from the previous years in which it couldn't drop? Oppositely to what happens to 100% mounts that get changed at the end of an expansion. In 2017 this can now contain Trajes del Festival de Invierno desechables, which in 2016 came from Obsequio ligeramente agitado. It can also now contain Acribillador endotérmico, which in 2016 came from Obsequio del Festival de Invierno. This Stolen Present is still the reward from the daily ¡Qué ruin!/¡Qué ruin! Still haven't gotten your Esbirro de Gruñoncio to drop? Still trying to complete your appearances with Ilusión: Llamas de Ragnaros or fill your toybox with Cojín de piñas ? This is how you farm Regalo salvaje and Regalo robado efficiently on multiple toons. Characters must be level 100 or higher and have a level 3 garrison. It's about a 5 minute flight to Gruñoncio (Frostfire Ridge 45, 28) from the Alliance garrison. If it's your first time there make sure and pick up the Bloodmaul Slag Mines flight path at 51, 21 to make the later runs a bit less monotonous. For Horde it takes about a minute to fly there from your garrison. Use your Piedra de hogar de Dalaran . Take the Dalaran Crater portal (make sure you're prepared against the fall with Kit de parapente goblin or any toy/buff/spell/etc that slows falling or negates damage). Izzy Silbacebo for 5 Suministros alegres which will buy you a Regalo salvaje from this same NPC. There is a problem with the order of things in your little guide but I cant post large comments below other comments to adress it there. The list suggests to start at the garrison, grab the dailies for frostfire ridge, complete them and then use the dalaran hearthstone to do the greench. But you are supposed to pick up the quests now. But those quests are in ogrimmar and ironforge. You only need to have your hearthstone set to orgrimmar if your char was never in a guild. Otherwise you can use a guild cloak of coordination (2h, 4h, or 8h CD) to get there. This way you can set your hearthstone somewhere else incase you want to do something else with that char than doing the dailies. What you should do is grabbing the quests in ogrimmar and ironforge first, hearth to your garrison, pick up and do the 4 event dailies, turn them in. You can use the shipyard compass to return faster to your garrison to hand them in because your garrison hearthstone is on cooldown. - If you are horde use the portal to ashran, use the portal to undercity, go and kill the greench and then use your cloak of coordination to reach orgrimmar. - If you are alliance, you should do it in a similar fashion but instead of going to ashran, use the method described in the guide. Hearth to dalaran and use the portal to the dalaran crater, finish the quest and then hearth to ironforge. On 12/23/2017 - I looted Clockwork Rocket Bot from Stolen Present and did get Clockwork Rocket Bot achievement. If you got all of the 34 items listed, there is no point in doing this quest anymore. Unless you think selling lots of low selling battle pets is worth it. I can confirm that Conjunto de armas de juguete & Conjunto de armas de juguete drop from the 2018 Regalo robado for either faction. Just got Conjunto de armas de juguete on my alliance character in 2018. Now after the Hearthstación with my 98+ ones.